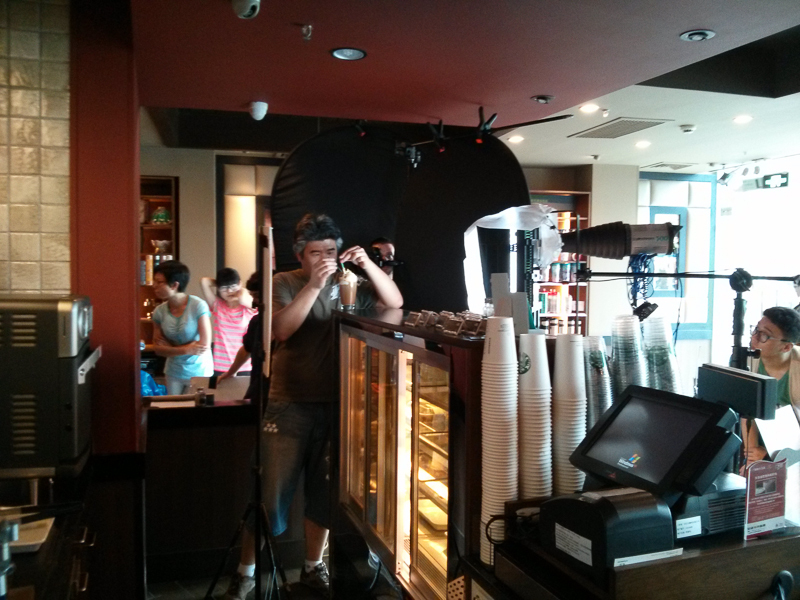 At the end of June 2013, we went on location to shoot three product shots for Starbucks. For the first of these shots, we really had to take control of our environment and used multiple scrims and blacks to block out and control the daylight. From there, we used various tungsten lights and reflector boards strategically placed to create our own subdued lighting to highlight the beverage. Other than the stylist having to get each coffee just right, this was the trickiest part of the day because the sprinkles were very small and came out quite heavy. We tried multiple methods in trying to capture a graceful sprinkling effect including the use of grinded up coffee beans to make the sprinkle seem larger. In the end, we resolved in taking a separate shot using a higher shutter speed and a concentrated light (in the form of a snoot) to highlight the falling of the sprinkles. Using post-production, the falling sprinkles were combined in the final image. Scott making faces in between shots. Justin fulfilling his "employee duties" by sweeping up the sprinkles after the shot was completed. Starbucks barista, food and drink stylists, and client deliberating on how to make the design more perfect. Chef Li putting on the final touches to the straw and drink, while Scott creepily looks through. The group looks on as the coffee is being prepped. Notice the large scrim and soft light to recreate a daylight feel as the weather outside started to take a turn for the worse and daylight dropped significantly. Congratulations to Ultraviolet from Scott and the Limelight team!